Women's Original Tall Gloss Rain Boots is rated 4.3 out of 5 by 19. Lancée en 1956, la botte haute Original est fabriquée à la main à partir de 28 pièces et selon le modèle d'origine, pour un ajustement et un confort exceptionnels. Ce modèle comporte un fini particulièrement brillant. Découvrez l'histoire de la botte montante Original ici. Rated 5 out of 5 by Buffy from Beautiful color My daughter absolutely loved these boots. They were a birthday gift hit! 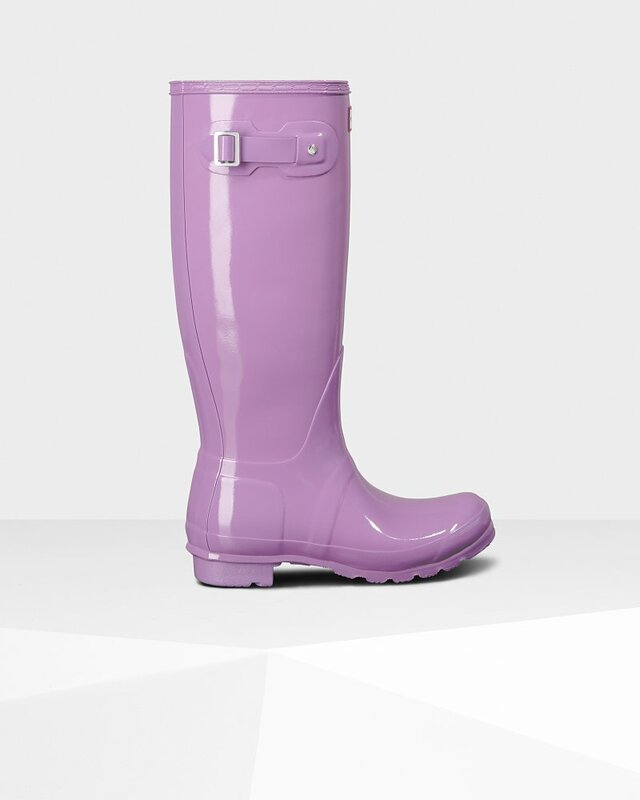 Rated 5 out of 5 by Glossy from Great rain boots and excellent quality. Bought these a month ago love them❤️ Best boots I’ve purchased. Rated 4 out of 5 by Gigi from Great colors and design I've always loved Hunter boots, their versatility and variety of colors. The only cons for me are 1) the slippery sole in the winter - I love wearing them when it's slushie outside, but I need to be very careful not to slip; and 2) the boots are a bit too tall, I'm 5"2' and they're up to my knees, I would have preferred 1-2' lower. Rated 4 out of 5 by Anonymous from Super fashionista boots! Run big... I love them so much! You can wear them for a classy look or for a casual look.. I hesitated between glossy navy blue and grey.. And I am totally happy with the grey. I usually wear size 8, unfortunately, I had to return them for a size 7. And now they fit perfectly!! Service was really quick! Here is a pic the first time I wore them! Rated 5 out of 5 by Stacy from I LOVE IT!!!!!!!!! I bought this for the hard cold in Quebec and it's perfect! I love it so much, the color is blue but next time i'm buying the yellow one. Rated 2 out of 5 by Avid walker from Leaked after first wear Unfortunately these boots did not keep my feet dry after the first wear. I walked through slush and puddles and both my feet at the toe area was damp. Except for the leaking, these boots are otherwise very comfortable and stylish. Note: I have re-ordered another pair to see if they keep my feet dry this time so stay tuned. Rated 5 out of 5 by Agnes from Great rain boots. Fits perfect, looks great comfy great colour Love it!. Rated 3 out of 5 by Meganruth from Cute but not warm My blue Hunter boots are adorable and great for fit but as soon as I step in water or snow my feet are freezing. This is the second pair I have owned and I thought maybe the first were defective but it seems that it is all of them. I wouldn’t pay $100 for these again.